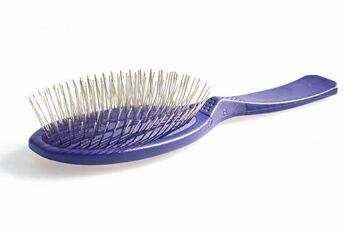 Professional soft pin brush in purple and simply the best pet grooming brush we have found. We think no grooming bag should be without this Madan pin brush! 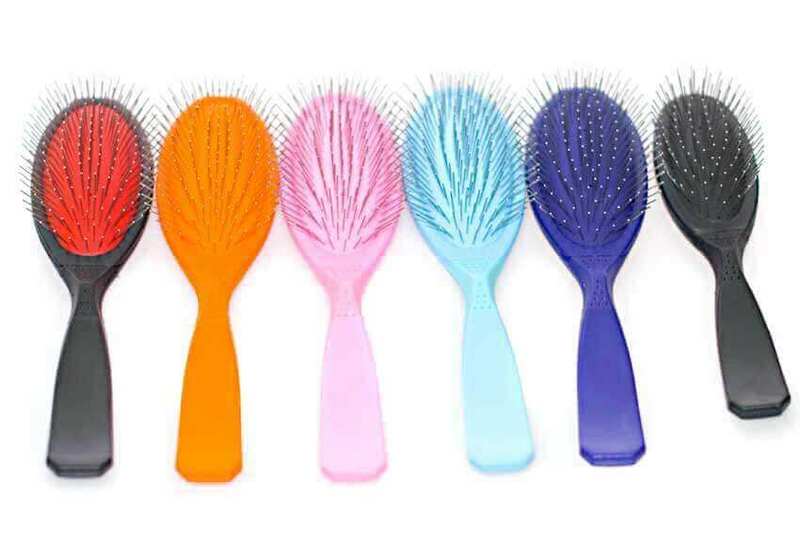 With a very soft cushion, this pin brush has the most "give" while brushing, making it ideal for lighter and single coated breeds like Afghan Hounds, feathered Salukis, Poodles, Cavalier King Charles Spaniels, Bichons, Havaneese, Chinese Cresteds and Papillons. It can also be used on puppies or for finishing touches at the dog show ring. The purple soft rubber cushion has 11 rows of 22 mm pins, which are manufactured with a patented design to prevent pins from being pushed in or pulled out. There are no ball tips on pins. As a result, we have very soft pin brush with no sunken pins. 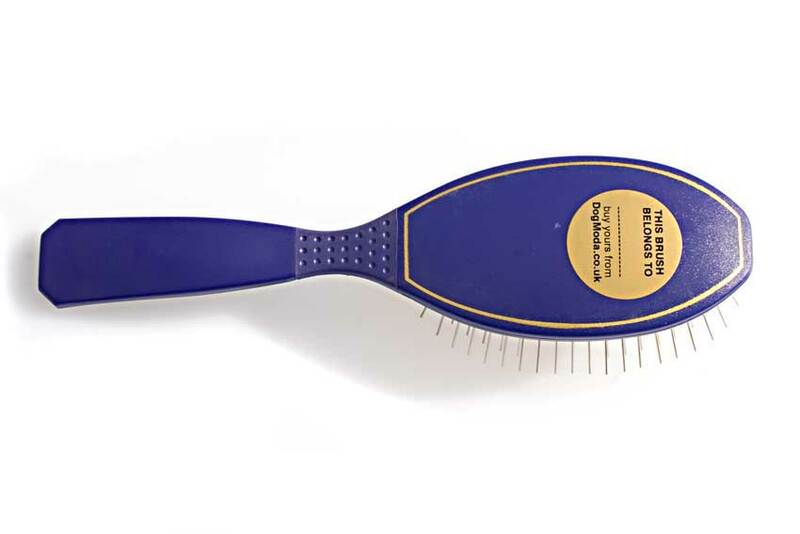 This pin brush measures 6.5cm / 2.5" across and 11.5cm / 4.5" high in the head, with the overall length being 23 cm / 9" long. It is extremely lightweight at just 74 grams as it is made from special thermoplastic polymer material with silicon rubber, creating brush with superior rigidity, strength, hardness, gloss and toughness which are little affected by temperature and atmospheric conditions. Madan pin brush has an ergonomic handle with anti-slip grip and follows a Kinesiology design to avoid professional groomer's damage or fatigue. These pin brushes are made to last. We still have our first that is over 15 years old now and has survived weekly grooming sessions of two Afghan Hounds and numerous dog shows. 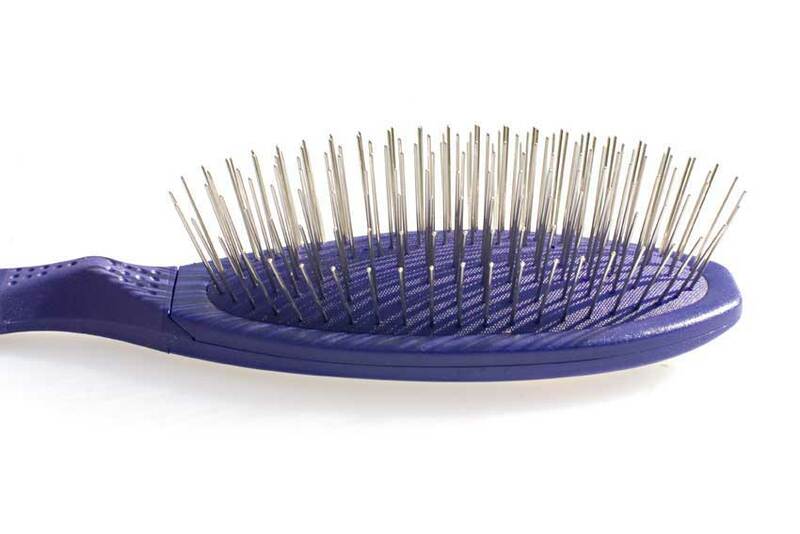 We are delighted to have this grooming brush in our UK stock and be able to offer this pet brush at such a great price. And the good news is we have have great discounts when you buy more than two of these pet brushes. Hurrah! We have already tried the brush and Susie (Cavalier King Charles Spaniel) says it's okay!